The Golden Mile Tower building situated on Beach Road in Singapore began life as Golden Theatre during the 1970s, before being split into a multiplex in the 1990s. Launched by Chong Gay Theatres, the Golden Theatre was the biggest cinema in Singapore when it opened with a 1,500-seater theatre. Golden Theatre remained a popular cinema screening Chinese movies until the 1990s. The main hall was then divided into smaller halls that screened mostly Hindi and Tamil movies. Today this building houses two cinemas that straddle different ends of the film spectrum. 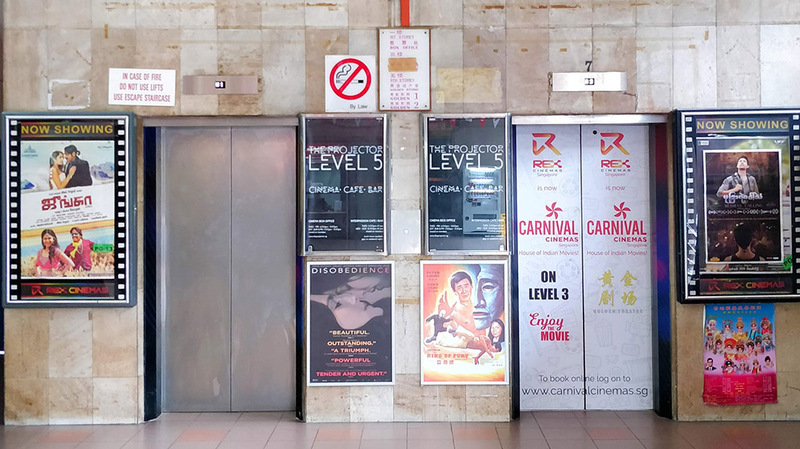 One is Rex cinemas on the third level that plays mainstream Tamil films and an occasional Malay film. The other is The Projector on the fifth level that aims to be much more than a space for arthouse cinema—it has a cafe-bar in the lobby, a bar in the carpark, a coworking space. Here’s what we got when Kurien decided to enter these two worlds with a camera. We recommend this interview with Ms Karen Tan, the woman behind The Projector; and the wiki page for Rex Cinemas. Kurien quit his engineering job of ten years to figure out what he actually wants to do. He is currently unemployed, and is doing a course in UX design. Meanwhile, he posts pics on his instagram @kuriensk, sells art at kuriensk.threadless.com and uploads bad recordings at bandlab.com/kuriensk.